Is the UK 6 year long panic low of 0.5% interest rates over? Are rates about to start on a trend towards normalisation as the Bank of England Governor Mark Carney was stating would happen barely 6 months ago? Or will the Bank of England remain paralysed by fear of a banking sector armageddon? And what are the interest rate implications from Britain's forthcoming EU referendum i.e. the risks of BrExit that could trigger much market uncertainty. 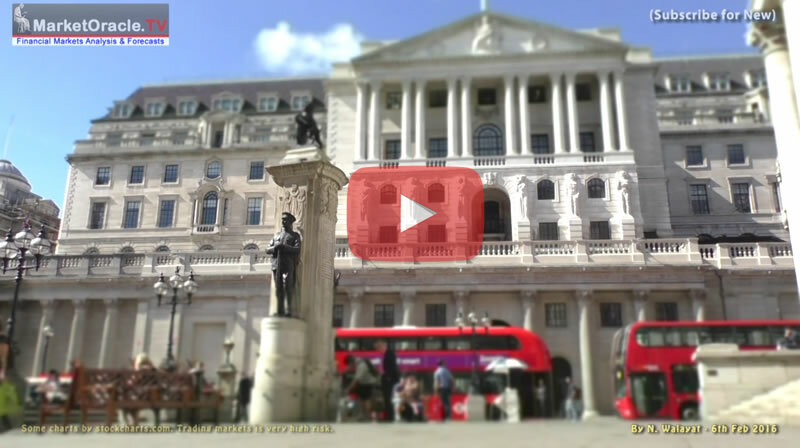 Find out in this comprehensive 28 minute video covering UK interest rates and economic GDP growth expectations for both 2016 and 2017. Hi Nadeem, looks like your forecast for stock market and oil was right on the spot until now. OIL reached 26 and S&P reached 1800 and both roared back on Thu/Fri, just in time for your 2-3 weeks bottoming process for them!!! Let us see from next week they will start moving up as forecast. Are you still thinking same or any changes in your forecast?